Dry scalps and dandruff-prone hair can ruin even the best hair days. The itch and discomfort combined with distracting flakes are enough to have you throw your hair up into a bun out of sheer desperation. A dry scalp lacks moisture, and should be handled as you would dry ends or dry skin. Treat an itchy scalp and dandruff flakes with a hot oil treatment and get back to enjoying your locks. Pour 1/2 cup of oil into a microwave-safe dish. Oils formulated for the hair, such as Argan oil, can be used or you can work with household options including olive or coconut oil. Place the dish of oil in the microwave on regular heat for 20 seconds; remove with caution. Brush your hair from roots to tips to remove any build-up from your scalp. Natural-bristle paddle brushes are best for detangling and redistributing oil. Use your fingertips to part your hair in the center, and brush your hair again on either side of the part to keep it in place. Pour the oil into a plastic applicator bottle. These are sold at most department or beauty-supply stores. Position the applicator bottle at the front of your part. Pour the oil onto your part, moving from front to back; repeat one time. Rub the oil into your scalp using your fingertips. Coat your entire head, concentrating on massaging particularly dry areas. Pull a shower cap over your hair, and allow the oil to sit for 30 minutes. Rinse your hair with warm water, and work a dime-size amount of sulfate-free shampoo into your scalp using your fingertips. Sulfate-free shampoos will not strip your hair of the moisture you just applied. Rinse your hair with warm water and condition the ends with an oil-based conditioner. Allow it to sit for 3 minutes and rinse completely. 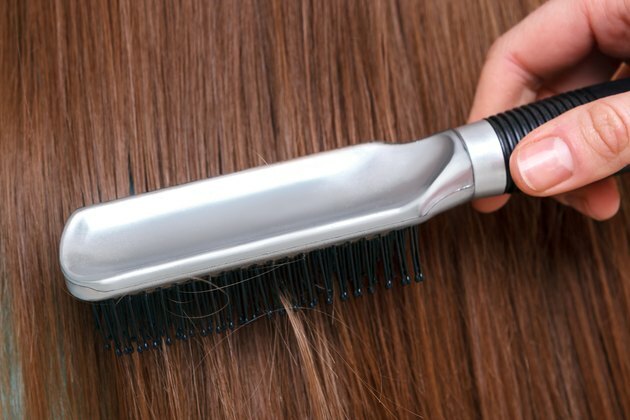 Gently squeeze the ends of your hair dry to avoid drying out your scalp.